This month LinkedIn continued it’s metamorphosis into a fully-fledged social (media) butterfly. Tortured metaphors aside, it’s clear that LinkedIn is incorporating the best features from other social networks but moulding them to fit its own unique offering. Advertising on LinkedIn is no exception. On 23 January it announced a new set of interest targeting options within its campaign manager. You’ll still be able to target potential customers by profile categories such as job title, company, sectors, company size, and skills. But now you have over 200 professional interest categories to choose from. These interests are derived from people’s activities on the platform. What articles do your potential customers read? What people are they linked with? These all help LinkedIn to build a profile of each person using its platform and then advertise to specific segments. What future developments are in the works? LinkedIn is also working on enabling Lookalike audiences, similar to those on Facebook. Lookalike audiences allow advertisers to target groups that are similar in demographics and interests to their known customers. Marketing to Lookalike audiences often yields good results. Our hope is that LinkedIn continues to develop its advertising platform to include Custom Audiences. This would allow you to retarget customers who have, for example, engaged with one of your videos. We’ve found this to be really successful as part of our Facebook ad strategy. Should I advertise on LinkedIn? 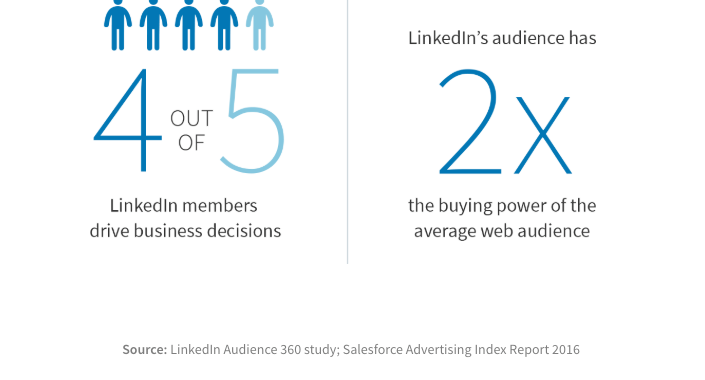 42% of businesses are planning to invest more marketing budget in LinkedIn. LinkedIn ads are generally 3x – 6x more expensive than Facebook ads. The minimum daily advertising budget on LinkedIn is £8, as opposed to £1 on Facebook. This shows that LinkedIn is becoming more valuable as a marketing tool. And, although adverts are more expensive, they may prove more effective particularly for those in the B2B sector. LinkedIn’s unique selling point is the immense amount of data it holds about people’s professional lives. It has information that the likes of Instagram or Snapchat wouldn’t have. So it’s a great tool for building professional business relationships. When compared to other social networks people are in a different mindset when using LinkedIn. This could lead to a better conversion rate. You also need to consider the potential value of your customer. Although LinkedIn advertising might be more expensive, you might reap bigger rewards. It might help set up a lucrative business partnership worth hundreds of thousands of pounds, rather than simply sell a one-off £20 item. Being able to target specific companies and sectors is also really useful as you can market yourself as a supplier to larger companies. 👍 Think about your business goals, beyond simply selling products or services. For example, if you’re looking to partner with another company, or supply to them, then targeted advertising could help you get noticed. 👍 Invest a bit of budget to test LinkedIn Adverts. 👍 Compare the results with any other social media advertising you are running. 👍 And if you need a hand, drop us a line!